In El Dorado County, California, a visit to the local library offers seemingly endless opportunities for young children to learn. You’ll find books galore, story times, kid-friendly events, and a staff dedicated to encouraging early childhood development. But in four of the county’s libraries there’s also a unique opportunity for parents and caregivers—to learn about and monitor their child’s ongoing development using Ages & Stages Questionnaires®. 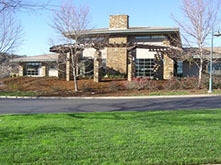 ASQ® screening itself isn’t a novel concept in El Dorado County. The county’s First 5 El Dorado Commission promotes the screening tools in early care and education settings and through its Together We Grow initiative, which encourages parents to complete ASQ and provides follow-up resources and referrals. But in partnership with the El Dorado County Office of Education and the El Dorado County Library system, First 5 El Dorado found a way to make ASQ screening even easier and more accessible. 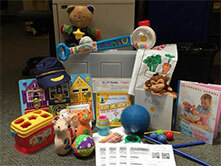 The Commission created 20 ASQ kits—boxes packed with everything a parent or caregiver would need to complete the ASQ®-3 and ASQ®:SE-2 with their child, like age-appropriate books, toys, music and other materials. And of course the questionnaires. “We wanted to make completing the ASQ a quick and easy process for parents,” says Kathleen Guerrero, executive director of First 5 El Dorado. She explains that the Commission was inspired to fund and create the kits upon noticing a decline in the number of parents who completed the questionnaire. The goal is to increase the number of families who regularly monitor their child’s development by increasing access to the necessary tools through the ASQ kits. In fall 2015, the bilingual kits (English and Spanish) began circulating at four county libraries. 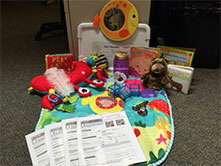 Each participating library has kits for the different ASQ age ranges: 0–8 months, 8–16 months, 16–24 months, 24–36 months, and 36–60 months. Debbie Arenas, an early childhood literacy specialist with El Dorado County Library, says the kits make completing the questionnaire more fun and efficient. “Not only does each kit encourage completion of an ASQ questionnaire—which is an important tool in the assessment of a child’s social and emotional development—it provides all the necessary materials right at the fingertips of the caregiver,” she adds. For example, the 0–8 month kit contains a mirror, feather, puppet, tummy-time mat, grasping or tugging toy, sound blocks, plastic jar for dropping and dumping, plastic keys and a variety of books. Not all families would have these items handy, and certainly not in one place. The kits make it possible to complete ASQ in one sitting, in just 10 to 15 minutes. Arenas reports that reviews have been positive. Parents and caregivers can opt to use the kit right there in the library, or check it out to complete the assessment at home. They can also choose to fill out the questionnaire on paper or online by following a link or QR code that’s included with the kits. Whichever way they choose to use the kits, users can expect thorough and supportive follow-up from First 5 El Dorado. Questionnaires are scored and reviewed by a family engagement specialist with an early childhood education background. The specialist meets with the family to discuss concerns, offer parenting support and activity ideas, recommend community resources, and provide referrals to early intervention services if needed. Katie Rinehart is one of the family engagement specialists from First 5 El Dorado’s Together We Grow program, and she believes the ASQ kit program, and screening in general, is a positive thing for both families and communities. “By encouraging caregivers to engage in learning about the development of their child from an early age, children are developing in a healthy way and entering kindergarten ready to learn and grow,” she says. It’s been less than a year since the ASQ kit program began, and the impact will not be formally analyzed until this fall for the Commission’s Annual Report. But Guerrero believes the kits are having a positive impact on El Dorado County’s screening numbers. She credits staff of the library and Together We Grow for promoting ASQ and ASQ kits at events and to casual library patrons. 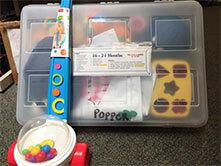 The extent to which families use the kits appears to be connected to how often they’re promoted during story times. You want the kits circulating—not just sitting in the library! Looking ahead, Guerrero wants to continue the initial long-term goal set for this project: to have more parents and caregivers in El Dorado County tracking their child’s development using ASQ. In FY 2016-2017, the Commission will fund a half-time family support specialist at five libraries. They’ll help with screenings, provide results, and provide a range of engagement opportunities to help parents as their child’s first teacher to better understand their child’s social and emotional development. Learn more about First 5 El Dorado.